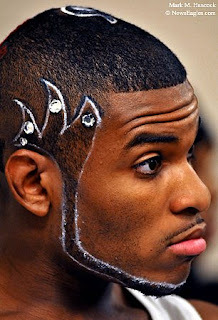 Rickey Nichols sports his style as he waits backstage before The World's Largest Hair Art & Fashion Show at American Airlines Center in Dallas on Sunday, July 27, 2008. 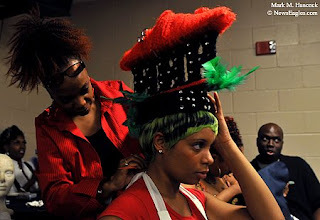 Dennetta Daniels (left) styles the hair of LaShann Durham (right) before The World's Largest Hair Art & Fashion Show at American Airlines Center. 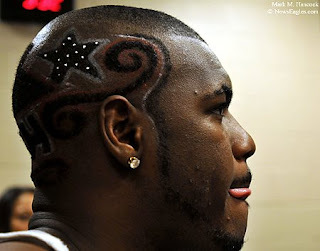 Kenneth Bollin sports his style backstage before The World's Largest Hair Art & Fashion Show. 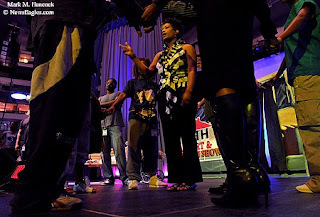 Nivell Williams (left) styles the hair of Talissha Johnson (right) before the show. Proceeds from the event benefit Haircuts for the Helpless and Homeless (HHH), which provides barber and beauty-salon services at homeless shelters and other locations. 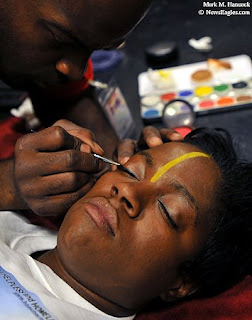 Terry W. (top) prepares makeup for Crystal Chatmon (bottom) The World's Largest Hair Art & Fashion Show. 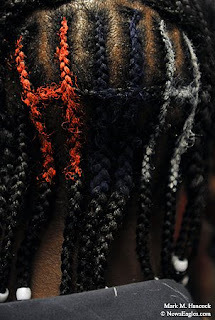 Keith Lowery sports the charity logo in his braids before The World's Largest Hair Art & Fashion Show at American Airlines Center in Dallas. Proceeds from the event benefit Haircuts for the Helpless and Homeless (HHH). 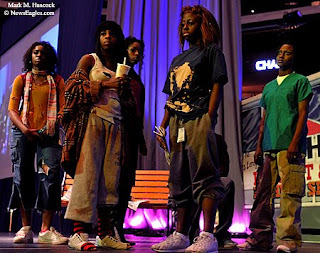 Ronniesha Jenkins waits for rehearsal to begin before The World's Largest Hair Art & Fashion Show at the American Airlines Center in Dallas on Sunday, July 27, 2008. Proceeds from the event benefit Haircuts for the Helpless and Homeless, which provides barber and beauty-salon services at homeless shelters and other locations. Ronniesha Jenkins (right) and others find their marks before The World's Largest Hair Art & Fashion Show at the American Airlines Center. 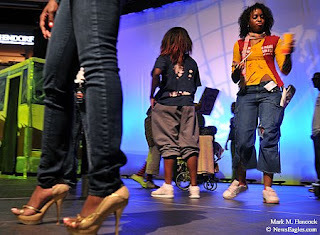 Angela Williams directs performers during rehearsal before The World's Largest Hair Art & Fashion Show. Performers listen to instructions before The World's Largest Hair Art & Fashion Show. Performers rehearse a dance routine before The World's Largest Hair Art & Fashion Show at American Airlines Center in Dallas. Proceeds from the event benefit Haircuts for the Helpless and Homeless, which provides barber and beauty-salon services at homeless shelters and other locations. Sgt. 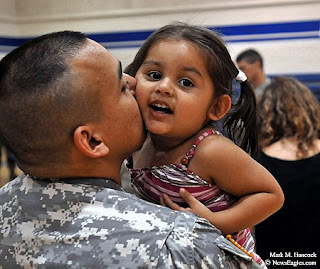 Victor Diaz (left) of Little Elm gives a kiss to his daughter Isabel, 2, (right) after a deployment ceremony for the 302nd Military Police Company from Grand Prairie at Vivian Field Middle School in Farmers Branch on Friday, June 27, 2008. Spc. 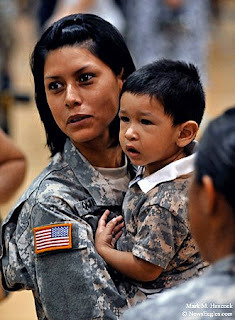 Celeste Quiroz of Dallas (left) holds her nephew, Joshua Zapata, 17 months, (right) after a deployment ceremony for the 302nd Military Police Company. 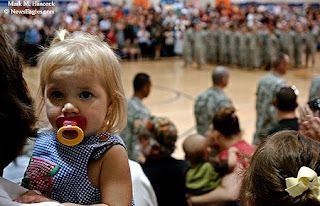 Olivia Whittle, 20 months, is distracted during a deployment ceremony for the 302nd Military Police Company. Her grandfather, Master Sgt. Rick Stuart will deploy with the unit to Iraq. Sgt. 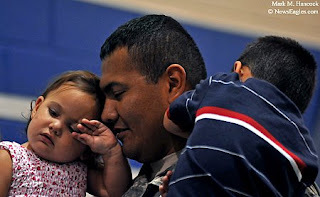 Julian Hernandez of Ennis comforts his daughter Kamryn, 1, (left) and son Jayden, 5, (right) after a deployment ceremony for the 302nd Military Police Company. 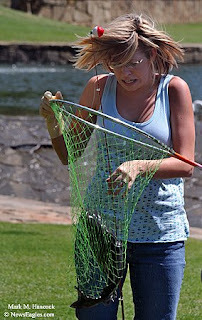 Tiffany Powell of Oklahoma City jumps away from a catfish she caught during a Family Day picnic for the 302nd MP Co. at Gussie Field Watterworth Park in Farmers Branch. 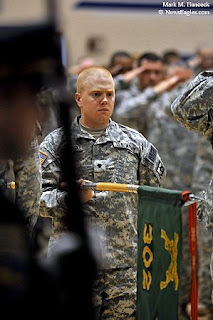 Her fiance, Spc. Damien Eckstein, is deploying with the unit Iraq. Sgt. Julian Hernandez (clockwise) has a laugh with his fiancee Lisa Chavez; daughter Kamryn Hernandez, 1; and son Jayden Hernandez, 5, during a Family Day picnic. 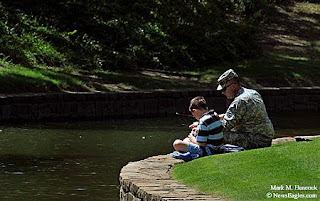 Jon Duncan of Flower Mound (right) fishes with his son Matthew, 8, (left) during a Family Day picnic for the 302nd Military Police Company from Grand Prairie at Gussie Field Watterworth Park in Farmers Branch. 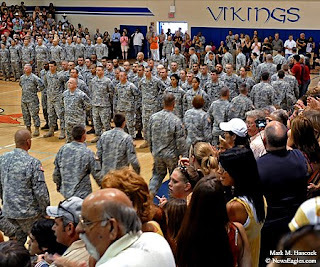 Please also see images from the deployment ceremony. 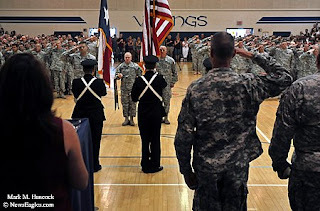 Soldiers of the 302nd Military Police Company from Grand Prairie salute the flag during a deployment ceremony at Vivian Field Middle School in Farmers Branch on Friday, June 27, 2008. Family and friends observe during a deployment ceremony for the 302nd Military Police Company from Grand Prairie at Vivian Field Middle School. 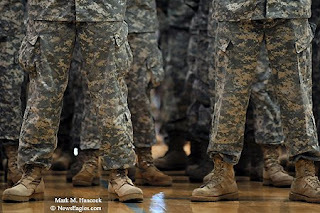 The unit is deploying to Iraq. 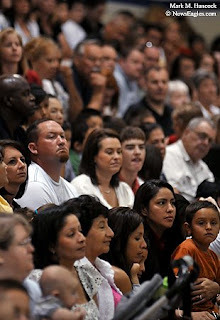 Family and friends observe as members of the 302nd Military Police Company from Grand Prairie enter the Vivian Field Middle School gym during a deployment ceremony. 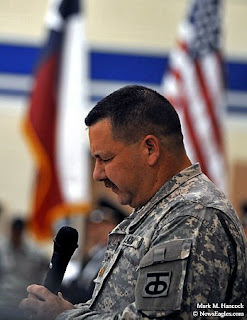 Maj. George Guerieri gives the invocation during a deployment ceremony for the 302nd Military Police Company from Grand Prairie. Spc. Duane van Holsbeke presents arms during a deployment ceremony for the 302nd Military Police Company. Members of the 302nd Military Police Company from Grand Prairie prepare to be more boots on the ground in Iraq during a deployment ceremony at Vivian Field Middle School in Farmers Branch. Please also see Family Day images. 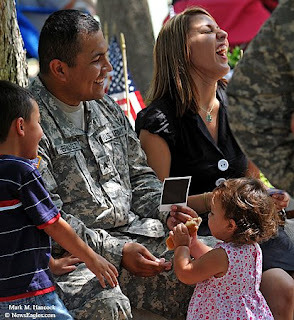 translated: "Relatives and soldiers involved in farewell ceremony"
Also, "Schools bids farewell to Grand Prairie Army reserve unit at ceremony" By Dan X. McGraw. 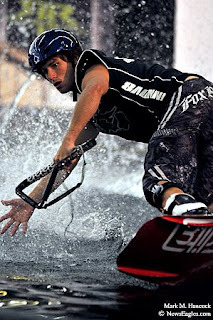 Dustin Shows of Granbury, Texas cuts after landing a move during the Wakeboard Rail Jam at the Dallas Boat Show at Dallas Market Hall in Dallas on Friday, July 25, 2008. Kelsey McClintick of Dallas lands hard after a move during the Wakeboard Rail Jam. Mark Brown of Grapevine, Texas takes a spill after a move during the Wakeboard Rail Jam. Brady Webb of Lake Bridgeport, Texas lands hard after a move during the Wakeboard Rail Jam. Rusty Scott of Lavon, Texas crashes after a move during the Wakeboard Rail Jam at the Dallas Boat Show at Dallas Market Hall. 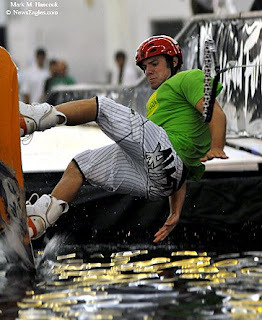 Wakeboarders added an edge to this year's Dallas Boat Show with an indoor rail tournament. The 1st Annual Concrete Bash indoor wakeboard competition was presented by Ridin Rails and features a cash prize. 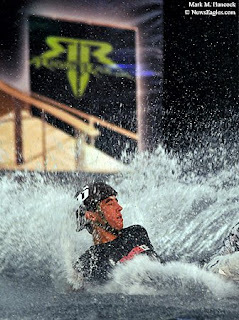 Wakeboarders competed on an indoor, dual-level course for style points. Riders were pulled through the course by a seven-horsepower, gasoline-powered winch towing device, which allows top speeds up to 30MPH indoors. 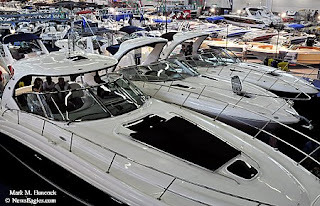 Patrons inspect the selection of luxury models during the Dallas Boat Show at Dallas Market Hall in Dallas on Friday, July 25, 2008. Attendance appeared low compared to previous years while patrons appeared most interested in boats with the highest and lowest price tags. The show continues through the weekend. 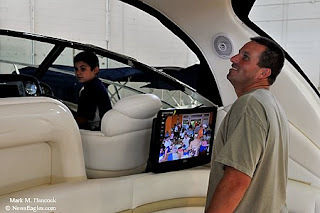 Brian Purcell of Barry, Texas (right) and his son Colton Purcell, 9, (left) inspect a Sea Ray 44 Sundancer during the Dallas Boat Show at Dallas Market Hall. 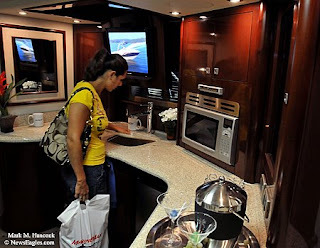 Nikki Purcell of Barry, Texas inspects the galley of a Sea Ray 44 Sundancer luxury boat during the Dallas Boat Show. 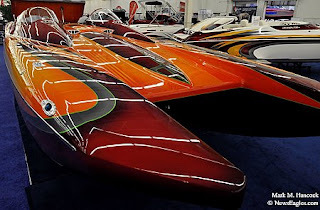 Eliminator Boats displayed their performance lines during the Dallas Boat Show. Boat fuel efficiency rather than horsepower is one of this year's greatest concerns. Attendance appeared low compared to previous years during the Dallas Boat Show at Dallas Market Hall. 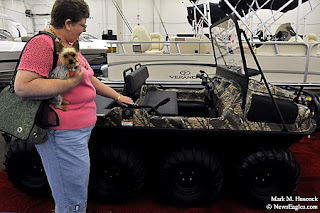 Patti Kriss of Highland Village carries Sheba, her 21-month-old Yorkshire terrier, as she inspects an Argo 8x8 Avenger 750 EFI amphibious off-road vehicle during the Dallas Boat Show. 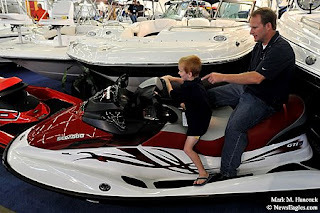 Daniel Querrey, 5, (left) and his father David Querrey (right) of Lewisville consider purchasing a Sea Doo GTI 4-TEC personal watercraft during the Dallas Boat Show. 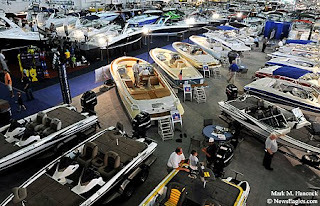 The annual Dallas Boat Show was established in 1954 and continues this weekend at Dallas Market Hall. The show features more than 800 boats from seaworthy luxury to amphibious entertainment. With fuel at record high prices, many Texans are cutting back on travel. Gas pump prices affect the roadways and waterways as well. Increasing fuel efficiency is important to boaters because drag and improper trim can mean less time on the water. Boat dealers and venders were available with fuel saving advice and devices. Roberto Castillo, president and CEO of the Pan American Soccer Association, poses for a portrait in his Dallas office on Friday, June 20, 2008. 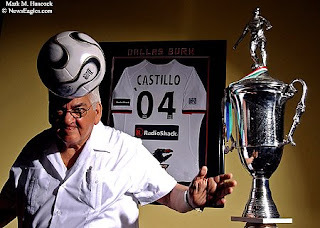 For 38 years, Castillo has been an amateur soccer leader for the Hispanic communities. The league has grown from 20 teams to about 90 and is expected to top 100 next season. The championship trophy is from the 1997 Copa Nuevo Leon tournament. One of his local teams won the international championship trophy in Monterey, Mexico. Please read, "Tiros de tu esquina: Precursor del gol" by Diego Aparicio. translated: "Tiros your corner: Precursor of goal." 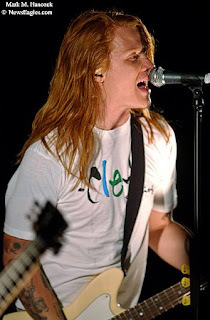 Aaron Gillespie of the rock band The Almost from Tampa, Fla. performs in concert at The Door in Dallas on Monday, June 23, 2008. 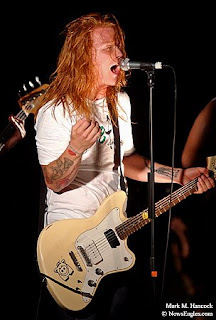 Aaron Gillespie of the rock band The Almost performs in concert at The Door. Gillespie is also the drummer for Underoath, the Christian emo-rock powerhouse. 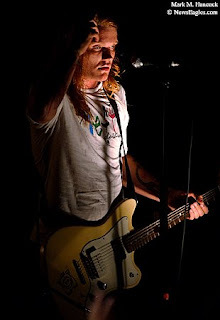 (above and left) Aaron Gillespie of the rock band The Almost performs in concert to a packed house at The Door in Dallas. 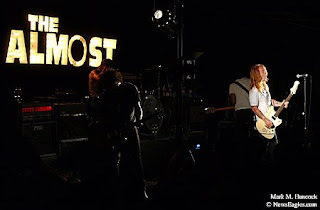 Please read, "Aaron Gillespie's side gig, the Almost, takes center stage" by Mike Daniel. I was up to my ankles in mud and ashes as I tromped through a forest fire when I got an urgent call from a reporter about a possible school shooting in another city. After I explained I was in the middle of a burning forest, she said she'd get more info about the school incident and call me back if it was something they needed. I kept working the fire. A few minutes later, my cell rang. I answered it expecting to hear from the reporter. Instead, it was a (semi-famous) model from a commercial shoot. Not wanting to upset the model and lose access, I tried to delicately say I was indisposed at the moment. It didn't work. The model wanted to talk about getting prints. Finally I said, "Can I call you back? I'm in the middle of a forest fire right now." The model said, "Yeah, we're all trying to put out fires..."
Fortunately, a firetruck's speakers blared. When it finished, I said, "No, I'm surrounded by flames at the moment and need to concentrate on staying alive please." The model said, "Oh yeah, you cover the news," and let me get back to work. While this one incident is memorable, it's not unique. I've answered strange calls from literally around the world - including some completely unknown-to-me languages. 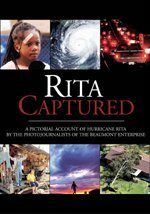 I've even gotten a panicked call from an 8th grader who needed to interview any photojournalist "right now" for a forgotten homework assignment. It's not difficult to find my cell number. It's listed on my Web site and printed on my business cards and invoices. I want clients to contact me when something is urgent. For non-emergencies, I prefer e-mails. My family rarely calls my cell because they understand what I do for a living. They'll call my home number or drop me an e-mail. They know I'll return the message. Not everyone understands the life of a pro PJ. Before I post my next entry, I needed to clarify this issue about mobile phones. PJs often don't know what we'll be doing in 10 minutes. Anyone with our cell number certainly doesn't know what we're doing when they dial our number. Unless it's urgent and work related, we don't need our cell to ring when we're in the middle of a courtroom. We really don't want it to ring while we're sneaking up on a bear or dangling off a mountain. While it's wise to set our phones on vibrate only, even this minor noise could get a PJ killed. Often, we're surrounded by too much noise to hear it ring. At other times, we're surrounded by destruction or simply too far away from a signal. So, PJs should carefully select the people who know our cell number. We don't want to make it too easy for everyone to dial our cells. PJs considering a completely wireless life might want to hire an answering service as a main number. While we want clients to contact us, they can e-mail or leave a message on our main work number. This also means it's vital to quickly return messages via e-mail or from our voice mail. 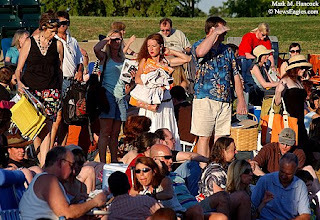 Theater fans look for a place to sit before a Shakespeare Dallas performance of "All's Well That Ends Well" at the Samuell-Grand Amphitheatre in Dallas on Saturday, June 21, 2008. 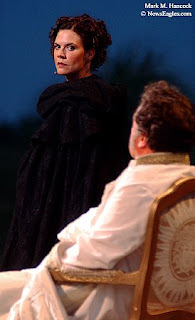 Helena (played by Joanna Schellenberg, left) debates the virtues of chastity with Parolles (played by Anthony L. Ramirez, right) during a Shakespeare Dallas performance. Helena (played by Joanna Schellenberg, left) makes an offer to cure the ailing king of France (played by T.A. Taylor, right) during a Shakespeare Dallas performance. Helena (played by Joanna Schellenberg, left) makes an offer to cure the ailing king of France (played by T.A. Taylor, right) during "All's Well That Ends Well." 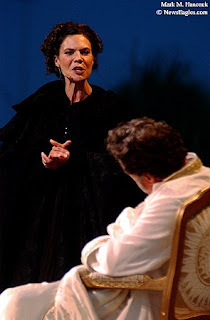 Helena (played by Joanna Schellenberg, left) listens to the king of France (played by T.A. Taylor, right) during a Shakespeare Dallas performance of "All's Well That Ends Well" at the Samuell-Grand Amphitheatre in Dallas. Please read, "'All's Well' at Shakespeare Dallas, especially Helena by Lawson Taitte. As most folks know, Hurricane Dolly is heading toward the southernmost Texas coast. It's expected to make landfall tomorrow somewhere around the King Ranch (hundreds of miles of cows and no access). As of 10 p.m. CDT, NOAA states it's still a Category 1 hurricane (like Hurricane Humberto) and not expected to strengthen much more overnight. I'll direct everyone to visit Michael Zamora's blog. He's a PJ at the Corpus Christi Caller-Times. He's covering the storm's northern edge, and his images are likely to be on the front pages of your favorite Web sites for the next few days. I planned to cover it if it became a Cat. 2 or higher over the Gulf. It didn't, so I stayed in Dallas. Although both cities are in Texas, Brownsville is about as far from Dallas as South Carolina or Quebec are from New York. I was willing to invest in a major storm, but can't justify the out-of-pocket expense for a Cat. 1 storm. 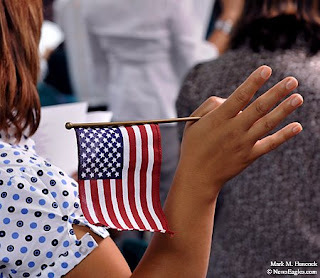 A legal immigrant holds a U.S. flag as she becomes an American citizen at the Department of Homeland Security in Dallas on Friday, July 18, 2008. Fayrouz Hancock becomes an American citizen at the Department of Homeland Security in Dallas on Friday, July 18, 2008. 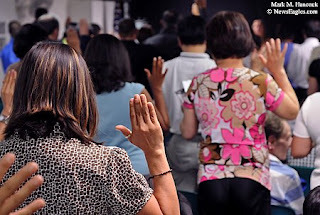 Legal immigrants take the Oath of Allegiance to become American citizen at the Department of Homeland Security. Fayrouz Hancock takes the Oath of Allegiance. Fayrouz was previously a citizen of Iraq and Australia. For the record, ICE allows family members to photograph the Oath and make photos next to the cardboard cutout. They pull black curtains over everything else during the ceremony. 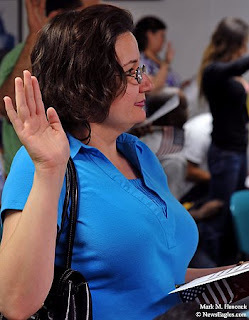 I've shot other citizenship ceremonies, but those were always in public venues. As y'all can tell, Fayrouz and I had a good day. It's unfortunate we don't see more images of this important moment in many Americans' lives. This is the point where the "pursuit of happiness" begins. After seven long years of struggles and setbacks, Fay is now a U.S. citizen with all the rights and responsibilities afforded to such. After we moved back to Dallas, the government finally decided she was a good girl long enough and granted her a citizenship interview. She's studied the citizenship manual since we lived in Beaumont and knows more information about the United States than many native-born folks know (name the specific Constitutional Amendments - by number - that address voting rights). We honestly expected today's appointment to lead to another appointment, etc. 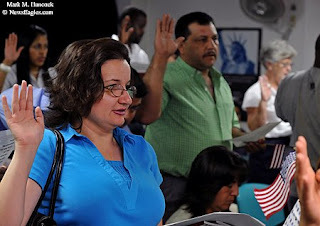 But they surprised us and asked if she wanted to take the Oath of Allegiance today. Four hours later, she became a part of the fabric of America. Because of my family history and service to the nation, I take citizenship very seriously. I have internalized it. I am a Patriot. It's strange, but I can't sing the words to the "Star Spangled Banner" because my voice will crack. I can't listen to "God Bless The U.S.A." by Lee Greenwood without my eyes filling with tears. They played Greenwood's song during today's ceremony. Both Fay and I were fighting a losing battle with big tears. Welcome home Fayrouz. I couldn't be more proud of you.